Available Sizes Floor Area: 11x22 sq. ft., 12x24 sq. ft., 13x26 sq. ft., 14x28 sq. ft.
Our company is known for providing an exhaustive variety of steel tent, steel tent booth. The raw material such as SS & MS is sourced from tried and tested vendors of the market. We use sophisticated technology and advanced machinery in the production of the range. Customers can avail this durable, sturdy and easy to install range at industry leading prices. 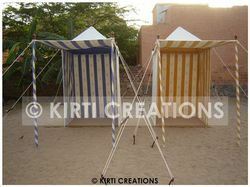 We are leading manufacturers of tents of versatile sizes and colors. The materials that are used in creating our range of outdoor tents are carefully selected from credible vendors. Some of the attributes of our range of outdoor tents are water proof, durability and fire retardant. Modular Steel Frame Tents offered by us are easy to install on steel frame with wooden lock door and an open porch at fore side. These can be used as lounge for relaxing and are in high demand by our clients. Our tents can easily resist strong structure and changing weather conditions. Modular Kitchen Aide Pvt. Ltd.